There is hardly any Easter egg can be found in modern operating system nowadays. In Windows Vista, some of the found ‘Easter eggs’ (if you claim it’s an Easter egg, as it may be a function or bug anyway) are time and date function in Notepad and hidden switch for screen savers. 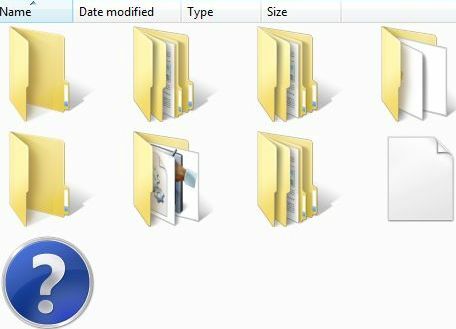 Another Easter egg (or probably is actually a bug) is to hide or make the name or title of the files and folders appear missing or disappeared when viewing files and folders listing in Windows Explorer, as shown in illustration below. To make the files’ and folders’ names disappear or hidden, run Windows Explorer (or any shell folder). Press and hold down Ctrl and Shift keys, and click on the Views button multiple times to quickly switch between the views available to display and list the contents of the folder. After several change of views, the “Large Icons” view will display without any name for folders and files, as in figure above. The symptom also happens in “Details” view. It’s unclear whether it’s a bug or Easter egg in Windows Vista, which affects also system already installed with Windows Vista SP1. After you manage to get the missing or hidden name effect, simply continue to browse to other folder to revert back or break the missing file and folder name effect. And, if your Windows Vista is facing the issue without using trick above (mean the folder and file name displayed in folder listing is always disappearing), the recovery step is to perform a disk scanning on drive that is affected by Check Disk. The ‘problem’ should be resolved and fixed after a system restart after system finished disk checking.